Teletalk 900TK 15GB Internet 30 Days. 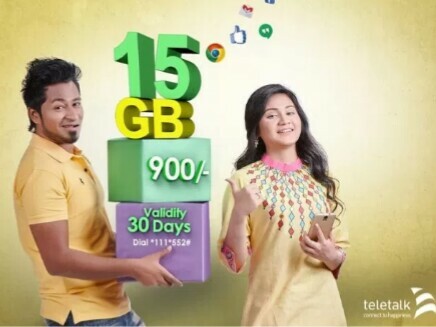 All the Teletalk Internet users can activate 15 GB Pack at 900TK. Do you want to activate it? Just read the below details. We have added all details about 15GB@900TK. The Activation code and balance check code is also available. The validity is 30 days from activation days. The Package Data can be used on the both 2G/3G area network. All prepaid customers are Eligible to activate the offer. To activate 15GB Pack, Type D26 (For Prepaid) or, F28 (For postpaid) and send to 111. Customers can also dial *111*552# to activate the pack. The Validity of this Internet package is 30 Days. Customers will be charged 900TK. VAT, SD and SC charges will be applicable. This is a promotional internet offer and continues till further Notice.